We received a shipment of collars and leashes today from Lupine (we are still waiting on West Paws Design stuff so stay tuned). We’ve noticed that our 1/2″ collars and leashes are not very big sellers so we’ve decided to return the product to Lupine and carry more 3/4″ and 1″ stuff as that seems to be what most of you prefer. So I unloaded the box, hung up all the new stuff and put all the leashes and collars that we are returning back into the box, and left it on the storage cabinet behind the desk to get it ready to ship back to Lupine. A little while later, I couldn’t find Chewy…I looked in all her usual haunts and still couldn’t find her. I started to worry that maybe she had gotten outside but then I spotted her. Good thing I didn’t mail her off! Well the adoption fair was a success! There were lots of people interested in the dogs and quite a few got adopted. My favorite girl Rika, unfortunately was not. She can jump a 6 foot fence and understandably, that causes some people to hesitate. Poor girl. She really is a sweetheart! You can find out more about the day (and little Rika) on the Prairie Dog Canine Rescue’s blog. We had a surprise visit this morning from Marlon with the B93 Breakfast Buzz. 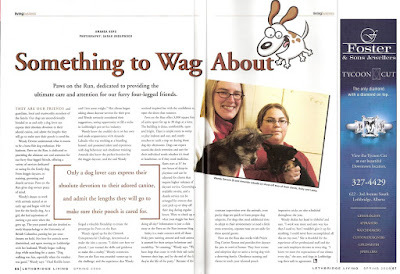 Paws on the Run and the Prairie Dog Canine Rescue were chosen as the business of the day! They thought we could use some nurishment before the Rescue’s big Adoption Fair this Sunday. Marlon arrived with some much appreciated muffins from McDonalds and coffee and chai tea! They are obviously used to offices with more staff as he showed up with 12 muffins and a full pot of coffee and tea! “Poor” Amanda and I did our best to eat and drink all we could. It was the perfect day for a treat because it was sure busy! Fridays are definitely our busiest days and today was no exception. This is the first time I’ve sat at the desk for more than 5 minutes and it is almost 4 p.m. I hope to see you out at the adoption fair. Come see the dogs and support the rescue. They will be fundraising by selling some very clever t-shirts for $25 as well as a variety of tasty homemade treats. Who knew a machine that cleans would make me so happy! We ordered the Hoover All-Terrain Steam Vacuum a month ago from ebay and it finally arrived. Just ask Amanda how impatient I have been. Our indoor play area is almost 3,000 square feet which is quite a bit bigger than my house (including the basement!). So as you can imagine, vacuuming and mopping it every day can be a chore. Especially when you consider the 20 odd dogs that are running and playing all over it every day. Mopping is okay for small jobs, but for such a dirty floor we found we would literally have to be refreshing the water every few minutes to get a truly clean floor. This obviously isn’t very practical. Hence the steam cleaner. When I thought about blogging about this new addition it made me wonder if I had ever officially announced the new additions to the Paws on the Run staff! I don’t think I have! That is Jolene above with the steam cleaner (see that dirty bucket of water!!!). She is working with me in the afternoons. And get this. She wants to clean! A woman after my own heart. Our other new addition is Sandy, who I’ve posted pictures of before here… Sandy is holding down the fort on Saturdays as she still has a “day job” that keeps her busy during the week. I think I’ve mentioned this before but one of the best things about working at the daycare is watching the shy, uncertain dogs become confident playful dogs. Legend started coming about once or twice a week just a few weeks ago. For his first few visits, his owners literally had to drag him through the door and we would have to drag him to the back of the daycare. And when I mean drag, I don’t just mean pull, I mean he was lying down and we pulled him along the floor. Once he got back with the dogs he was a little timid but not petrified. He started with the smaller and calmer dogs and gradually moved “up” to the bigger more active dogs. In his last few visits, he started to play bow and chase some of the dogs and yesterday, for the first time, he walked in the door full of confidence and was eager to come into the daycare! Now that he has gotten his sea legs, he has a lot of fun. With some dogs, it just takes a little patience and time. Lately we’ve been trying to get our photos back under control. It is an on-going, never ending process as we take photos almost every single day. When we download photos they are put into a folder for that specific day. We then sort them into folders for each dog. I’ve now gone and taken my favourite one of each dog (this is harder than it sounds!) and saved them in another folder marked “2009 Calendar”. I’m preparing early this year. If we managed to get any decent pictures of your dog these past few months we’ll be e-mailing them to you shortly (if we have your e-mail address that is). We’ll then burn them onto CD’s and then erase them from the computer as the computer tends to slow down over time with all the pictures. I don’t think Coco and Rosie left each other for more than a few moments all day yesterday. Everywhere one went, the other was sure to follow. They are pretty cute, so you can hardly blame them! Perkins manages to find “luxury” wherever he goes! Maggie Mae felt that she also has grown up lots at the daycare so here are her comparison pictures. She is looking really hard to look dignified but that is hard when you have something sticking out of your mouth! We are very excited because the newest Lethbridge Living is available! Not only is this a great magazine, with terrific photos and good stories, but it has a story about us! You can read it by clicking on the picture to make it bigger or you can pick up a copy at the daycare if you are interested. When I was picking up the magazines, I noticed the Heriette Plas Photography studio was right next door. I just found out last week that she offers courses on digital SLR photography and I’d been meaning to call to see when her next class was. Turns out she has one starting April 30. I’m very excited. She has promised to get me off the automatic settings. So watch out for better photos in May!